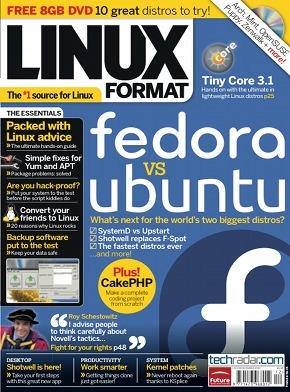 FOR THOSE who did not managed to buy December’s issue of Linux Format, there’s an interview with me there, as noted some months ago. Here is the raw text which hopefully explains a little more about Techrights and yours truly. * How did you get involved in Open Source? I was first made aware of UNIX and Linux some time in the 90s when few friends from school used them experimentally. In computer science classes (my majors) there were many of us geeks. It wasn’t until ten years ago that I got introduced to Red Hat and became a user immediately. I loved so many things about it. In 2001 I was writing and sharing all my programs as Free software and in 2002 I got a job where I wrote GPL-licensed code (mostly GTK based). This then introduced me to GNU and I soon learned more about the associated philosophy. At the time I was not using the term “Open Source” although I was aware of the term. It wasn’t until much later (around 2005) that I realised the term ought to be used in order to better align with the mainstream press, which tended to characterise as “Open Source” code that everyone shared in this way. To me, sharing of code was always natural and I never wrote any proprietary software in my entire life. I don’t intend to, either. It is possible to get paid to write code to which you retain all sensible rights. It’s more rewarding and motivational, not just beneficial to one’s peers. There is no better feeling than to help those who help you. This period of my life also got me involved as a contributor in several Free/Open Source projects, notably WordPress which I used a lot. In cases where colleagues’ code was not truly licensed (just copyrighted, naturally), I did try to encourage the sharing of code because as a scientist I knew that our joint work would have greater impact if it was adopted and used by others. Thus, my involvement in “Open Source” was more than about code; it was a way of life and I still try to advance the principles of Free software/Open Source in the context of data, literature, hardware, and the sciences in general. Transparency is not the key advantage in my eyes; it is more to do with promoting abundance rather than scarcity where limitations on access are only artificial. Restrictions empower those already in power and it doesn’t have to be that way, especially not in the digital world. TechRights is a platform where a strand of ideas are expressed, borrowing from influential and important establishments like the Free Software Foundation yet acting completely independently (there are no sources of funding and thus no self censorship or bias). TechRights can be seen as complementary to some groups, but any such similarity is only perceptual as there was never any affiliation. TechRights has 3 domain names and several activities/components, such as a blog, a wiki, and three real-time communication channels (IRC) divided by topics. Several months ago we also added angle-based distinctions, categorised under the banners named “TechRights”, “TechWrongs”, and “TechChoices”. The site’s focus is Novell, Microsoft, and sometimes even Apple not because they are the sole threat to people’s freedoms and digital rights; in the field of software these are the areas where we have greater interest, prior supportive material, and expertise. * What is the history of TechRights? TechRights is the site name proposed by Tracy, the guy who is hosting the Web site. We needed a new name when the site’s scope had expanded. It was long overdue. We hope to invert the connotation of the word “rights”, which is increasingly being hijacked by those who take people’s rights away. * TechRights used to be called Boycott Novell, why the name change? Yes, “Boycott Novell” was created by Shane just days after Novell and Microsoft had signed their problematic patent deal. The site was expected to have narrow focus and deal with just this one aspect of the problem Free software was having. As I recall it, “Boycott Novell” was actually a category name in Shane’s personal/technical blog, but it became its own domain name and soon enough many people subscribed to the site. As readership grew, the range of topics expanded. At the time of joining the site — very shortly after its inception — I was working on my Ph.D. thesis and I had a lot of spare time which I used to write a large number of posts for the site. At the moment we have about 11,000 blog posts, just over a hundred megabytes of IRC logs, and various other pages that are actively edited by the community. We hope that quantity has not compromised quality. * Do you still feel we should all Boycott Novell? I am not in a position to tell people what to do, but I advise people to think carefully about Novell’s tactics of selling SLE* (SUSE Linux Enterprise) using software patents. Novell has attempted to change the rules by imposing on GNU/Linux a restriction that never existed beforehand. Novell came to Microsoft and negotiated for about half a year what later became a patent deal. This put Novell in a position of perceived advantage over Red Hat et al. Since then, Novell has been urging businesses to buy SUSE based on Novell’s software patents (Novell euphemistically calls it “IP peace of mind”), which Novell turned into a selling point in this battlefield where software patents are antithetical. The name “Boycott Novell” was never my idea and I have always felt some unease about the name (it sounded too negative and about 80% of my output was positive), but I do encourage people to vote with their wallets and reward companies that are not using software patents to sell their products. For the GNU/Linux market to thrive and for new businesses to be derived or emerge from it, software patents will need to be stopped. Novell is not unique in that regard and TechRights attempts to deal with the issues, not just individual players. * TechRights has been a controversial site, what is your take on the controversy? Every person or platform that dares to touch sensitive subjects is bound to be labelled “controversial” or be characterised as “irrational” by its adversaries. This is especially true when one departs from purely technical debates. Over the years we have had people distort or misrepresent our views, which are harder to control or manage when one works within a framework involving many people or when people spread false rumours (disinformation) from the outside. For instance, some people began to associate the site’s formal views with people who just leave comments in it or enter the IRC channel. Some people wrongly assumed that a protest in India — going under the banner “Boycott Novell” — was in some way organised by the Web site. What we find encouraging though is that when people come and speak to us directly they soon realise that we are decent people and the stereotypes/caricatures that sometimes float out there are just daemonisations designed to marginalise our views. There are clearly some companies out there which are unhappy with our work. Truth hurts sometimes. Since we are open to feedback, companies have an opportunity to challenge every claim, not by ad hominem attacks but by rational debate. We have already had anonymous Novell employees smearing messengers from within the site and from outside the site. They usually get exposed at the end and then they vanish. * What changes would you like to see happen in Open Source to alleviate some of your concerns? There are many issues that need correcting and by staying passive nothing will ever improve, it will only get worse. One of the areas we are active in the ending of software patents, which need to be eliminated even in the Open Source world (IBM, for example, ought to rethink its patent policy because it’s pro-software patents). The Open Source/Free software community ought to be open to criticism from within, even if this criticism is somewhat discomforting at times. The ultimate goal is to further enable users and developers, who over time seem to be increasingly captured by draconian/centralised entities like application stores that censor, so-called ‘clouds’ which are managed from afar, and restrictive licences that ratify and solidify DRM, kill switches and violations of privacy. * What do you see as the future for TechRights? TechRights is a platform which is in many people’s hands and if it helps outsiders view matters differently, then we know we did our part. Most of the activity takes place in IRC, so as long as our community drives the agenda in particular directions, that will be the future of the platform. In the future we hope to maintain information resources written in a language which is more defensive than offensive. When dealing with difficult subjects where detractors of freedom become maliciously active, it is tempting to lose one’s composure. The ultimate goal is to educate less than to campaign. We don’t organise campaigns but we sometimes spread comical memes that help warn about dangers which we label in order to raise awareness. For example, we consistently write “Vista 7″, “Fog Computing”, and “hypePad”, all of which are terms designed to convey the real downsides of those latest threats to software freedom. You are wrong on one issue. Software patents aren’t the problem. Patents are the problem. The problems with Software, Genetic, and Business Method patents are more visible. It’s easy for example to criticize Amazon’s ‘One Click’ patent, while not realizing that there are many ‘Hardware’ patents that are worse. Consider KSR v. Teleflex, where the patent (which cost in excess of $10 million US to litigate) covered a change in position of a switch. That’s right, moving a switch on a control arm was considered a ‘patentable invention’ and the litigation went all of the way to the Supreme Court of the United States. I’m not certain of what the best solution is to a broken patent system. The only answer I have been able to come up with, is shutting down the patent system totally. As you can imagine, this suggestion was meet with considerable horror in certain circles. I think it’s hard to fight for reform on so many fronts at the same time. Conventional patents on hardware go a long way back. “Over the Internet” patents are recent and should be easier to trim. That’s the mistake that FFII is making, thinking that there is a difference, when there isn’t. The problems with both are the same, attempting to address one without addressing the other will doom them to failure due to a lack of consistency. It also shows a lack of understanding of Patent Law, but that’s another issue. Remember that it’s easier to combat something before it’s tilted into existing law (such as software patents in Europe, DMCA in some places, ACTA anywhere). Anything else involves civil disobedience. Specialization is not a mistake it is efficient. People should persue the things they know about and are interested in, then educate others. Focus is not so much a lack of consistency as it is knowing personal and organizational limits and working to accomplish the possible. It may be time to eliminate mechanical patents, but we should not let this issue divide an obvious consensus on software and business method patents. Just about everyone can agree that patents on ideas should be eliminated. But the main problem is in the United States, that is where the battle will be won or lost. Even our old pal Gene Quinn admits that there are problems, and you know what a patent maximalist he is. I’d hardly call him a “pal”. Actually I quite like Gene. He’s a nice guy, if a bit misguided. No, make that a lot misguided. I view him as rude, crass, and pretentious. From a legal standpoint, it may not be possible to separate hardware, software, genetics, and business method patents. Consider the U.S. Supreme Court hearing for KSR v. Teleflex for example. Now from a legislative standpoint, yes, you could attempt to separate them. However that would then be subject to court challenge, at which point the court may rule that there isn’t a difference, and that they shouldn’t be treated differently.